Youth Program — The Rev. Linnette C. Williamson Memorial Park Association, Inc. 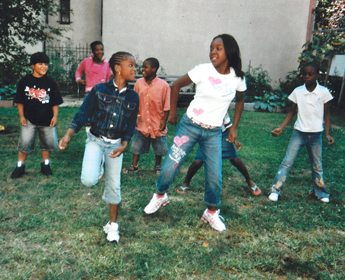 The Art and the Gardens Summer Youth Enrichment Program was created in 1997 as a means of rescuing low-income children in Central Harlem from the dangers of drugs, gangs, delinquency and violence during the summer. Through this program, 25 children from ages 5 to 11 are given the opportunity to grow and learn under the supervision of professional staff. The program was brought to fruition under the auspices of Shirley E. Johnson, a professional artist and educator and the program’s first Director, in collaboration with members of our organization including Edward P. Bowman and Dorothy Morris, the first president and secretary of the organization, respectively. Art and the Gardens educational enrichment program provides positive and challenging experiences in art, horticulture, environmental education, music, dance and more, with the goal of improving basic academic and literacy skills. The Park Association offers this summer program at no charge to the children’s low-income families. A significant enhancement to the program curriculum began in 2002 through our partnership with The Bank Street College of Education, a national leader in innovative children’s learning. Bank Street assists our staff in designing activities that aim to help children increase academic and literacy skills as well as learn critical life skills including peaceful conflict resolution through arts, gardening and other activities and workshops. Program activities include field trips and on-site activities in our four parks. In the past, children have visited important cultural and educational sites including the Museum of Natural History, Studio Museum of Harlem, a working farm, The Rose Planetarium, Central Park Zoo, and the Cloisters. Art and the Gardens 7-hour program runs daily Monday to Friday, from early July to late August (a total of 7 weeks). In addition to the consultants from Bank Street College, the program employs staff including a program director, counselor or assistant director, one or more group leaders and/or youth workers, and a maintenance worker. Art and the Gardens would not have been possible without the generous support of The Christ Community Church of Harlem.